I didn't bring any physical books to New York with me, and I am still not sure if purchasing books I really want to read in e-book format is something I want to do, so much of my reading while in this massive city has been dictated by what is available on Project Gutenberg or Amazon's free classics section. This hasn't bothered me at all, though perhaps some of you will be wondering why the heck I'm reviewing some very obscure and random books. There are more random and obscure reviews to come, I assure you. I suppose when the author is as famous as Frances Hodgson Burnett (of The Secret Garden fame), the work can't really be called obscure. 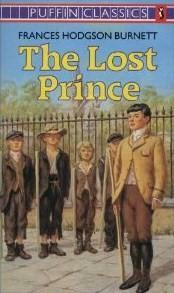 But I for one had never heard of her book The Lost Prince and certainly never read it growing up. But I read it now, and while I probably didn't enjoy it as much as I would have if I had been 12 years old, I still thought it was a good read. The Lost Prince centers on Marco Loristan. Marco has had an unconventional upbringing, shuttling about all over Europe with his father and one servant, living a pretty poor life. He is Samavian, but the country of Samavia is in civil war. Marco's father, Stefan, is a Samavian patriot and often has clandestine meetings with political figures. But Marco himself leads a lonely life, with very few friends his own age. That is, until he meets some street children that practice military drills, headed by a crippled boy who calls himself The Rat. Marco and The Rat become fast friends and soon are asked to set off on an adventure that is greater than either of them ever imagined. While I enjoyed this book, I think it's definitely one that is for younger readers. I would probably rank it more as "children's" than "young adult." The title itself is a bit of a spoiler, I think, and it is pretty hard to believe that Marco goes through the entire story (and it's a pretty substantial-length story) without putting two and two together, considering how intelligent he is always described as being. That is another thing that became a little wearing. Between Marco and his father, there weren't many imperfect characters in this book. Both are like gods on Earth, always calm and fair, never letting their emotions get the better of them, never making a mistake. It was certainly inspiring, but also rather wearing. I got a bit tired of everyone looking at Stefan with a "worshipful" gaze because of how much peace and goodwill he radiated out. There was also a plot line in the book that I thought was very sloppily done and not dealt with in any manner that made sense. Marco is once kidnapped by people grilling him for information on his father and Samavia. He gets away, only to run into one of the kidnappers again. He gets away one more time and... that's it. There's no more mention of the kidnappers, they play no further role in the book, and there is no resolution as to what happens to them. I am not sure why they were in the story except perhaps to add excitement to it. And really, that is kind of what makes my complaints above moot. This is a children's story, and children deserve to believe in white knights and heroes and grand adventures had by minors. It's fun and imaginative and I think this book would be a great bedtime story for kids probably about six to nine years old. In a way, it makes me think that I am saddened by my cynicism sometimes. Throughout the book, I just kept thinking that no one could be that perfect. That there must be a flaw, and people will realize what it is soon enough. I started thinking about the likelihood of certain events occurring, and the suspension of disbelief. I think that's why, often, children's books don't work as well when read in adulthood. We never approach life with that sense of idealism and wonder that we had when we were young, and so books like this do not hold quite the same magic as they used to. But it's still nice to read them, once in a while, and remember what it was like when you thought that all the world needed was one great hero to save it. You know, I think that cynicism that you mention is why I never feel comfortable reading books targeted at middle grade readers. There are a lot of books out there that I just feel a little too jaded to read, and though they should ideally strike me as whimsical, for some reason, I end up being annoyed, or worse yet, sarcastic about them. I guess maybe there is a reason why this was not one of Burnett's most famous works. I have never heard of this book by her before either! I guess this is the good thing about free downloads. Brings obscure books back into the mainstream a bit. Arghhhh, blogger ate my comment! Thanks for reminding me of this one. I read it when I was about 12, and loved it. I think it's quite different from her other books - much nearer to adventure stories of the day like The four feathers, or The prisoner of Zenda. I enjoyed it, but even when reading it as a child, I was never entirely convinced by the plot in the way that I was by the rather more unworldly Secret garden and A little princess (which still remains a favourite). I agree with you about the problem with suspension of disbelief - I had that problem recently with a book I'd previously enjoyed. I think when the author sets up a magical world, you're more prepared to believe, but as soon as it comes nearer to reality, it becomes that much harder. At least that's what I find. Glad to see though that Lost Prince is available as an e-book, I lost my copy during a house move, and would love to read it again. Zibilee - Yes, jaded is a good (but sad, too!) word to describe my reactions. I didn't feel very whimsical about this book at all. I mean, it was probably great for a 9-year-old, but I just can't imagine that the king had NO flaws and I ended the book thinking, "Well, now that you are king, I bet people will turn on you pretty quickly!" SAD, right? Kailana - Yeah, it's cool that it gives books the opportunity to come back! Though sad in that authors/families can't make money on them any more. Bookhound - I have The Prisoner of Zenda and didn't realize it was written in that time period at all. Good to know! I think you're right, though, about realism vs. straight magic - it's hard to suspend disbelief. I'd never heard of this one either. It's weird; I think I've simultaneously assumed that Burnett wrote tons, and that she never published anything besides THE SECRET GARDEN and THE LITTLE PRINCESS. Those are certainly the only two I've read (and, to be honest, I'm not sure I ever finished TSG. I was a fickle young reader.). This does sound like something I'd have loved when I was a kid, though I imagine my own adult cynicism would make it a little difficult for me now. I can reread books I really loved when I was a kid, but I don't seem to be very good at discovering new children's books. I reread Dune recently (originally read it 13 years ago) and you are right - people really change their views of certain books when time passes by. Just discovered you, via Dovegreyscribbles--I'm so pleased. Have you read Violet Needham's "The Emerald Crown"? This is a more sophisticate lost prince story and I can reread it with pleasure still, many years on. Memory - Yes, I know what you mean! She DOES seem to have a lot of books, but no one seems to have read them... I hear The Shuttle is quite good, though, so I shall tackle that by her. Ondrej - Yes, absolutely! It is kind of sad, but I guess it shows that at least you've changed. Erika - Oh, thanks for stopping by! I've never read or even heard of The Emerald Crown, but it's now on my wish list. Thanks for the recommendation! Great review! Sometimes older books tended to treat characters as either all-bad or all-good. While I enjoy going back and reading my childhood favorites, today's books are much more realistic. Bahahaha, oh, Frances Hodgson Burnett. I love her even when (as here -- I read this one too, and I wouldn't feel too bad that you weren't able to approach it with a childlike spirit; I think I'd have not liked it even as a kid) she's being totally ridiculous. The Shuttle is supposed to be very good (says my mother), and if you're in the mood for something Edwardian and silly, you should read The Head of the House of Coombe and its sequel, Robin. Robin is another character that people gaze at because of her extraordinary beauty, but I am fond of the books anyway. Little Robin is this poor neglected little orphan girl, and she befriends a handsome little boy who teaches her about mothers and love, and they fall in love, oh gosh, but then, he goes off to war, and things happen, and it's all very snuggly and absurd. There is also spiritualism. D'you know that she didn't write children's books? They weren't classified that way at the time she was writing them. (I was surprised by that but it was a kindler gentler age, maybe.) They were pretty much best sellers of all ages. She also was one of the first authors to lock down copyrights. Okay, all these obscure facts about FHB and I've never heard of this book! !